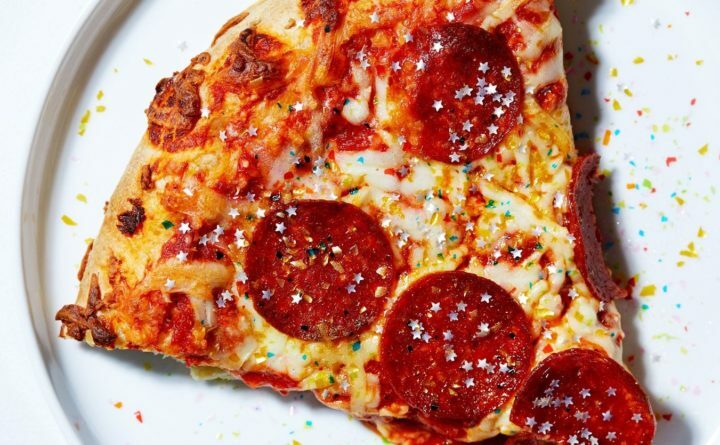 Edible glitter has been popping up on more and more food items lately. First things first: There is a difference between “edible” and “nontoxic” glitter. This is an important distinction you will need to remember if you want to participate in what is shaping up to be one of 2018’s biggest and most controversial trends — decorating everything from cookies to pizza with a sprinkling of shiny sparkles. And no, it’s not the kind you buy in the craft aisle. “It gives it this really cool — it’s hard to describe, but lava lamp galaxy effect in the glass,” said Madeleine McCarthy, who made a glitter beer called Gold Dust Woman for Sasquatch Brewery in Portland, Oregon. “You can see all of these glitter swirls. All of it coming together in the glass is pretty magical.” The beer sold out in less than a week. But recently, glitter has made a somewhat disturbing leap into savory foods. Glitter bagels are a thing. One London pub made glitter gravy — its sparkles an odd contrast to the brown, meaty sauce — to cheer up a basic roast. A rainbow glitter pizza from Santa Monica, California, got some buzz on Instagram. It’s only a matter of time before people take it one step further. Imagine glitter ramen, glitter burgers, glitter coq au vin — this is our dystopian future.